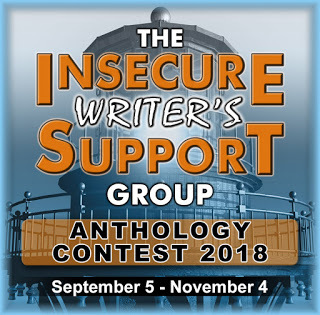 We've gone through almost half the year already and now it's the time of month for a posting of the Insecure Writer's Support Group. Join us by going here. Post your fears and neurosis (if you have them) and encourage other writers. Captain Alex's awesome team this month is made up of Beverly Stowe McClure, Tyrean Martinson, Tonja Drecker, and Ellen @ The Cynical Sailor! N.B. Next month, because of July 4th holiday in the U.S., we'll post on Tuesday, July 3. Yes, it's time to start thinking about the next anthology. My how the time flies! Theme: This will be revealed on September 5, along with the judges and other details. Your short story might be included in the fourth anthology! Be sure to start preparing yourself. There is also the IWSG Twitter Pitch coming on July 19, so stay tuned for that. Optional question this month: What's harder for you to come up with, book titles or character names? For me, the story title usually comes to me first. Then, I'll spend a little time thinking about the characters' qualities and find suitable names for them. Each book is different so this doesn't happen the same way every time. What about you? I wish titles came to me first! Looking forward to another anthology. They've all been so good. Titles are easier for me than naming the characters. Have a great day. Enjoy your day too, Beverly. The main characters' names come first and then everything else falls into place as I write. We all work so differently to come up with beautiful results. I usually have to land on a title before I can start seriously thinking about a story. Characters' names are much harder. It's interesting. For some people it's the title that comes before the characters. For some it's characters first. I think that makes a difference in the difficulty of naming something. You're the first one who answered that the title came first and easily. I love how everyone has their own methods and habits. You're a rare one who finds the title comes easily. But a few writers are saying the same as you. Wish I was too. Best wishes with your next anthology. Where do you find all the time? Titles always take me forever to figure out! Character names are much easier for me. All the best for your next anthology Joy. You are an inspiration. A clever book title always hooks me. Love choosing names. I find that part easy. After having written so many books,(is it 20 books or thereabouts? )I'm sure you have a method for finding names/titles that works.